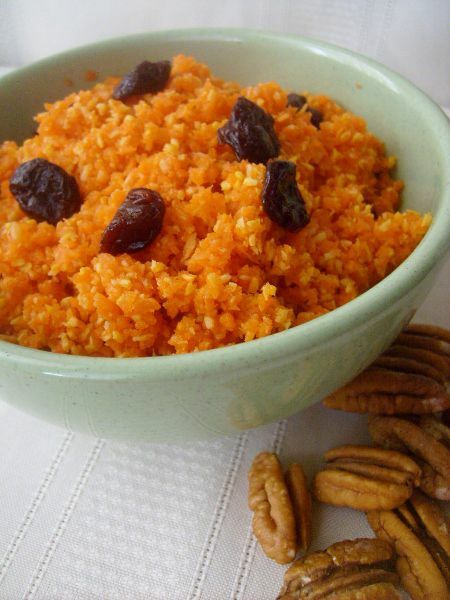 A wonderful Carrot Raisin Salad Recipe...the combination of the crunchy carrots, chewy raisins and gorgeously sweet coconut dressing is superb! This colorful salad is packed with nutrients not to mention delicious taste. In a bowl combine all of the ingredients and mix until thoroughly blended. Combine with the carrot salad. After reading about the goodness of carrots and trying this recipe, you will be seeking out more reasons to add carrots into your diet. Anti-Aging – Eating carrots will make you LOOK good. Yes, not only will they help you to see good too! The antioxidant beta-carotene which carrots are rich in is a powerful antioxidant. Among other benefits, this antioxidant seems to be able to slow down the aging of the cells. The slower your cells age, the better you look and feel, in short, YOU age a lot slower than your non-carrot eating peers. Heart Health - Along with the beta carotene, carrots also contain alpha-carotene and lutein. These also with the heart healthy fiber (a mere ½ cup of carrots contains 2 grams of fiber) helps to reduce cholesterol levels. Want all of the benefits of carrots but don't care to eat bunches of them? Carrots are great juiced. Adding the juice of an apple will make for an even more delicious beverage.